Mind The Joint – Slippy When Wet! You are here: Home / Rider News 2010 / Mind The Joint – Slippy When Wet! According to Roads Service the bridge joints where replaced during June and August to ensure their continued high performance in coping with today’s traffic volumes. 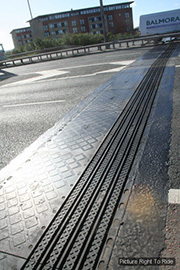 The joints appear to be fine in dry weather and an improvement to the “dips” prevalent in the previous joints, (which were only a few inches wide but created a slight jolt when ridden over), however the new joints are nearly 2 feet wide and riders have found that they cause their motorcycles to lose grip when these joints are negotiated in wet weather. While motorcyclists should treat these covers like any other hazard such as wet gratings, painted road markings, mud, leaves, diesel etc. 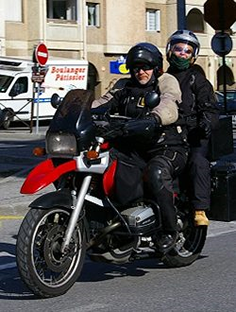 riders should not have to deal with a hazard that appears to have been designed into the road infrastructure without taking motorcycles into consideration. While riders have written to the DOE Minister, Roads Service Chief Executive and their MLA, the joints remain a hazard in everyday use. It would appear in this instance that the Roads Service has not met three of its key objectives which we would assume include motorcycles. Was there any consideration given to motorcycles in the placing and fitting of these covers? Do these covers meet all required standards for installation in the roads infrastructure? Are motorcycles included in any standard that is required for the use and fitting of these covers? Will the Roads Service, either itself or any appointed contractor responsible for the auditing/purchasing/fitting of these covers, investigate the dangers that seem to be posed to motorcyclists and rectify any hazard? At present we are waiting for an initial response from The Department for Regional Development, responsible for Roads Service to find a solution to this “accident waiting to happen” and see what can be done.